Forty-seven high-profile professional go players — including Michael Redmond 9P — will be participating in the Tokugawa Memorial Go Congress in Shizuoka, Japan next February. The event will run from February 11-18, 2018, with a main daily tournament game, followed by other events including instruction and commentaries by professional go players, as well as a 13×13 tournament, go relay, and kids tournament. Tokugawa Ieyasu was the founder and first shogun of the Tokugawa shogunate of Japan, which effectively ruled Japan from the Battle of Sekigahara in 1600 until the Meiji Restoration in 1868. 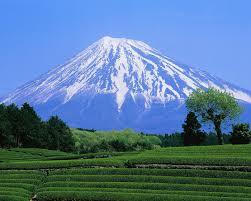 Shizuoka is a city on the south coast of Japan. It’s known for views of Mount Fuji from Miho no Matsubara beach and the Nihondaira Plateau. A cable car links the plateau to Kunōzan Tōshō-gū, an ornate 17th-century shrine and original burial place of Shogun Tokugawa Ieyasu. Sunpu Castle features ruins of the original castle and a recreated turret. The Toro Museum archaeological site displays Iron Age dwellings. Iyama defends Oza and Tengen titles: Everything is going well for Iyama Yuta these days, both internationally and domestically. In quick succession, he defended two of his top-seven titles, making sure he ends the year with his Grand Slam intact. On November 20, the third game of the 65th Oza title match was held at the same venue as the second game (on the 18th, covered in my previous report, published on the 21st), that is, at the Hotel Okura Kobe in Kobe City, Hyogo Prefecture. My description of the second game needs to be revised in light of the Go Weekly report. Apparently Ichiriki (white, at left) took the lead in the opening and in the middle game he built a winning position. However, Iyama made a do-or-die attack that ended in his capturing a large group and pulling off an upset. In the third game, in contrast, it was Iyama (white) who got a good position in the opening (mainly because Ichiriki was burdened with a heavy group). In the middle game, he kept up the pressure on Ichiriki and forced him to resign after 174 moves. This gave him a 3-0 lead, so he defended his title. It is his third Oza title in a row. One rest day may not have been enough for Ichiriki to recover from the shock of letting slip the second game. The fourth game was scheduled to be played in his hometown of Sendai, but he couldn’t take the match that far. The Oza prize is 14 million yen (about $127,000). The third game of the 43rd Tengen title match was played at the Munakata Yurikkusu, an entertainment/sports/cultural complex in Munakata City, Fukuoka Prefecture, on November 24. Playing black, Iyama (right) built central influence in the opening, but Ichiriki attacked his centre group and tried to blockade it. In response, Iyama cut the blockading group into two and tried to surround the centre part of it. Ichiriki came up with a clever answer, so his group was able to break out, but in the subsequent fighting he missed the best sequence. After that, the game went downhill for him. Iyama set up and won two successive ko fights, also killing a white group in the second fight. Ichiriki resigned after Black 171. Iyama’s fighting ability gave him the edge over the challenger. This win made the score 3-0, so he completed his Tengen defence just four days after his Oza success. Finishing off both these titles so quickly earns Iyama a lot of extra time for rest and recuperation in December. The Tengen prize money is 13 million yen (about $118,000). Iyama has now won 48 titles, so he has moved ahead of Kato Masao into equal fourth place with Otake Hideo. It will take him a while to overhaul the players still ahead of him: Kobayashi with 60, Sakata Eio with 64, and Cho Chikun with 74. Starting with the third game in last year’s Tengen title match, Ichiriki has now lost nine games in a row to Iyama. He has just over seven weeks to regroup before the Kisei title match starts. First of all, he will have to adjust to two-day games. 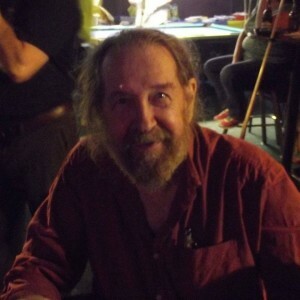 A long-time member of AGA (#568), Olson was an organizer of the Oklahoma Go Players Association in Oklahoma City for several years. He attended go congresses at least from 2009-2016 (he won the 7-kyu section in 2016) and was part of the U.S.A. delegation to Cuba in 2013 (he was credited for photos in the E-Journal), reports Ted Terpstra. 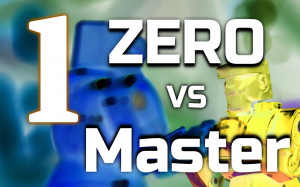 After taking last Friday off, Michael Redmond’s AlphaGo video commentary series officially launches an AG Zero-Master series Friday at 6p EDT, with at least four more Zero-Master commentaries planned through the end of the year. 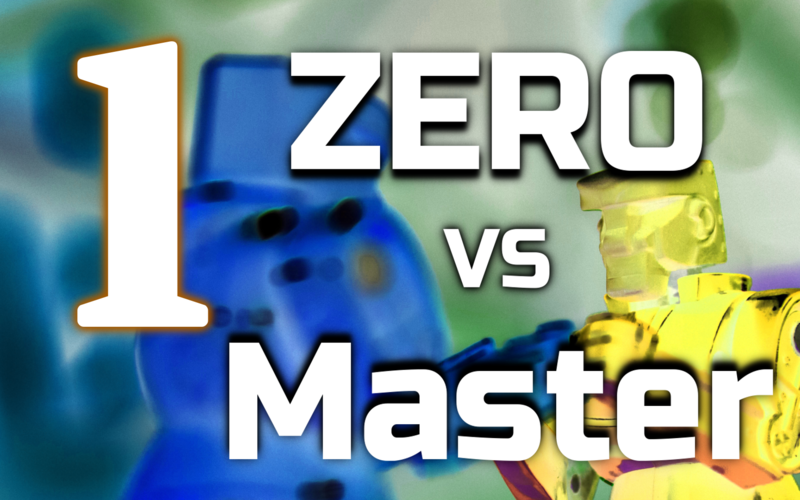 Click here for the first Zero-Master commentary. 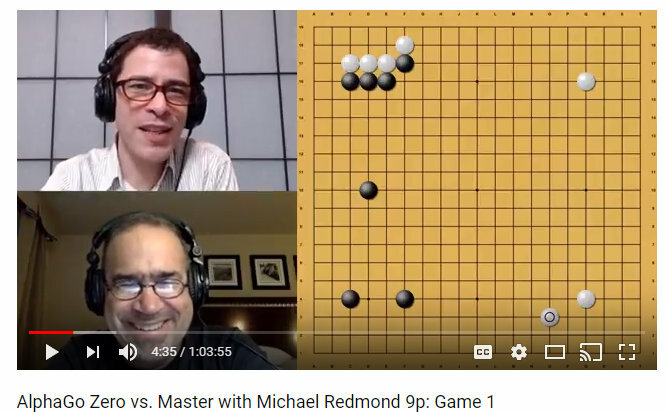 Meanwhile, click here to check out Redmond’s exploration of Zero’s main openings and here for a playlist of 15 Redmond commentaries on the AlphaGo self-play games. 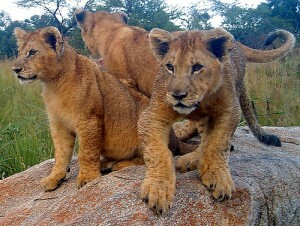 There’s less than a week left to sign up for the American Go Honor Society’s Young Lions Tournament. The deadline is this Saturday November 26th. The AGHS website says “Young Lions is a premier youth tournament for the new generation of go players to earn their first titles. Youth players from the United States, Canada, and South America will earn the right to battle for glory. But this road is full of pitfalls and dangers. Who will emerge as the leader of the Pride?” All youth players 18 and under are welcome to participate in this online tournament. The tournament will be held on the 3rd and 10th of December on KGS. Click here to sign up, and click here to view the rules. Bill Camp, former Manager at the Seattle Go Center, has surfaced in the world go community four years after moving to Australia. With his wife, Marian, he recently launched kimonoquilt.com, which offers refurbished antique gobans, stones, bowls and other go accessories, along with quilts Marian makes “from fabric used and loved and worn in another life.” Like the quilts, the go equipment merges old and new, as Camp uses his experience with fine woodworking to bring antique go equipment back to life. Shibano picks up first league win: Two games were played in the 73rd Honinbo League on November 16. Kobayashi Satoru 9P (W) beat Motoki Katsuya 8P by resig. and Shibano Toramaru 7P (B) beat Yamashita Keigo 9P, also by resig. The latter result will probably attract the most attention. 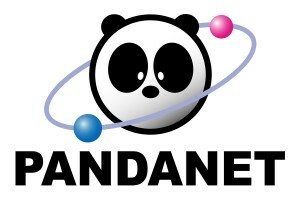 Shibano is a breath of fresh air in the go world, and a lot of Japanese go fans would like to see him stir things up. The second round has now been concluded. Ida Atsushi 8P has made the best start with two wins, Hane Naoki 9P the worst with two losses, and all the other players (Ko Iso 8P and Yo Seiki 7P besides players already mentioned) are all on 1-1. Fujisawa levels score in Women’s Honinbo: The fourth game of the 36th Women’s Honinbo best-of-five was held in the Special Playing Room at the Nihon Ki-in in Tokyo on November 17. 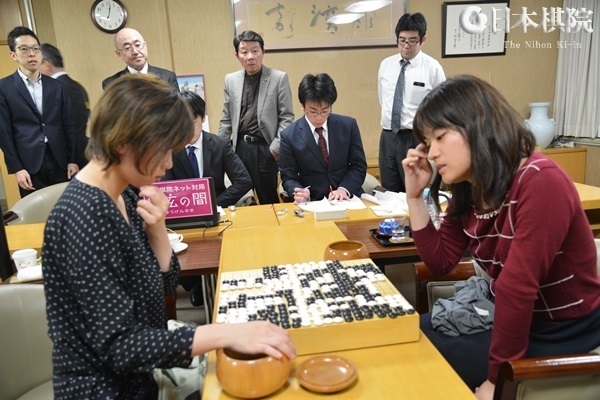 Xie Yimin (left), the challenger, had won the third game, so this was a kadoban for the defending champion, Fujisawa Rina (right). Taking black, Fujisawa won by 2.5 points after 270 moves. Apparently, the game was good for Xie, but Fujisawa overhauled her in the endgame. The final game will be played on November 29. Suzuki makes Tengen main tournament: A while back (at the end of September), I reported on the success of Fujisawa Rina in reaching the main tournament of the Gosei tournament, this being an unusual achievement for women players. Suzuki Ayumi 7P has now become the tenth woman to do so. On November 16, she beat Ryu Shikun 9P in the final of Preliminary A of the Tengen tournament, so she won a place in the main tournament (she had white and secured a resignation). 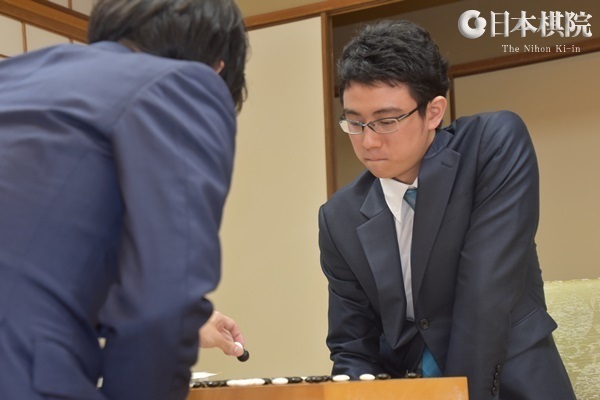 Iyama increases lead in Oza: The second game of the 65th Oza title was held at the Hotel Okura Kobe in Kobe City, Hyogo Prefecture, on November 18. The game started at 10 a.m., with Iyama (left) playing black. 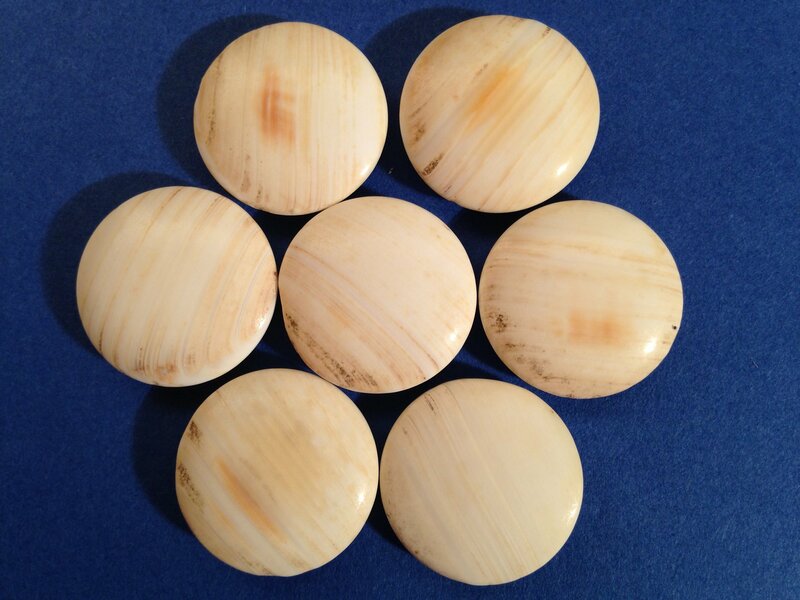 The players have a time allowance of three hours each, with the last five minutes allotted to byo-yomi. The game was full of the aggressive kind of fighting that is usual for title matches these days, but Iyama took the lead and hung on to it. 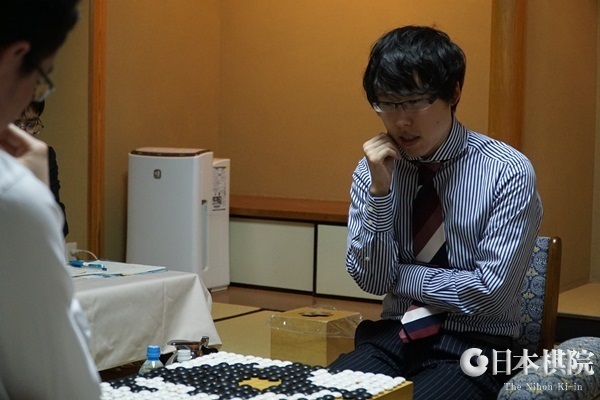 The game ended at 7:33 p.m. after 325 moves; Iyama won by 4.5 points. The third game will be held at the same venue just two days later, so the match could well be over by the time this report appears. 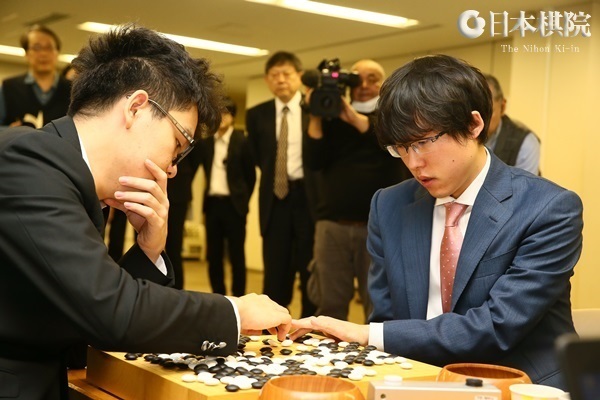 Iyama and Xie to meet in LG Cup final: A Japanese representative had made the best eight of the 22nd LG Cup, so the Nihon Ki-in offered to host the quarterfinals and semifinals at its headquarters in Tokyo. If one motive was to give its player the advantage of playing on home ground, this worked out just right, as Japan got its first finalist in a world championship since 2007. That year was also the only previous time that Japan hosted LG Cup games. All the games were telecast with live commentary on the Igo & Shogi Channel. The quarterfinals were played on November 13. 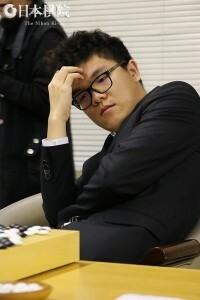 The results were as follows: Ke Jie 9P (China) (W) beat Shin Jinseo 8P (Korea) by resig. ; Xie Erhao 5P (China) (W) beat Choi Cheolhan 9P (Korea) by resig. ; Jiang Weijie 9P (China) (W) beat Lee Wonyong 7P (Korea) by half a point; Iyama Yuta 9P (Japan) (W) beat Yang Tingxin 6P (China) by resig. The LG Cup is a Korean-sponsored tournament, but no Korean players made the semifinals, so perhaps Korean fans didn’t mind the tournament’s being held overseas. 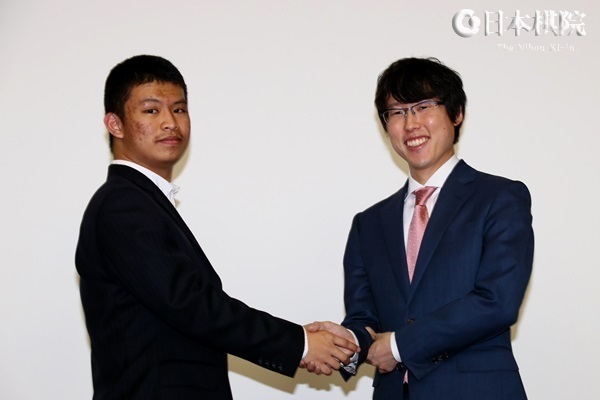 Lots are drawn after each round to do the pairings for the next round, and Iyama (at right in photo at left) was paired with Ke Jie (left), who is widely recognized as the world’s number one. In this tournament, the player who wins the nigiri can choose colors; Ke (right) took white—perhaps he was influenced by the fact that White won all the games in the quarterfinals. He started out with two three-three points, showing the influence of AI. In contrast, Iyama played the high Chinese Opening. Initially, Ke took the lead, but in a later fight his play was perhaps a little too aggressive, letting Iyama get back into the game. Later on, Ke made a mistake and resigned after 267 moves. In the all-Chinese semifinal, Xie (W) Jiang beat by resig. The best-of-three final will be held on February 5, 7, and, if needed, 8. Iyama has won the TV Asia Cup, but this will be his first final in a full-scale international tournament. If he wins, it will be Japan’s first international title since 2005, when Cho U won the LG Cup. Unfortunately, I have no information about Xie Erhao. 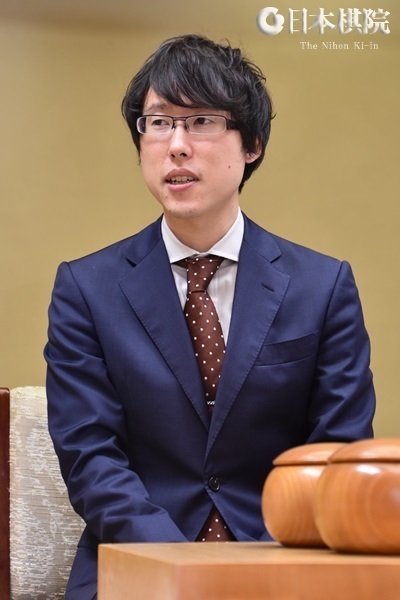 Ida defends Crown title: The Crown tournament is open only to players at the Central Japan (Nagoya) branch of the Nihon Ki-in. 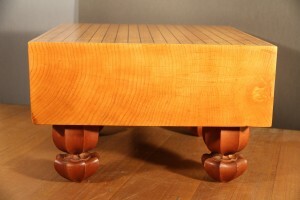 First prize is 1.7 million yen (about $15,400). Ida Atsushi 8P won this title for the first time last year and was able to defend it this year. The one-game final was played on November 13; taking white, Ida defeated Mutsuura Yuta 7P by resig. after 174 moves.